The Ottoman Empire (establ. in 1301) advanced rapidly until it spread all the way from the Euphrates to the Danube. The Byzantine Empire shrivelled away until it was reduced to a few territories and a small enclave around Constantinople. Unlike the Arabs, who thought the use of firearms dishonorable, the Ottomans became masters of artillery. In 1453 they brought their cannons to the gate of Constantinople and stormed the Christian capital after a siege. The Greek Emperor was killed; the great church of St.Sophia was plundered of its treasure and turned into a mosque. 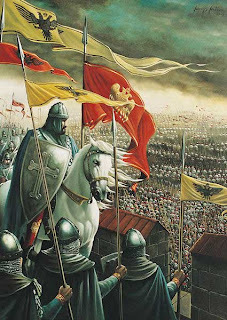 The Fall of Constantinople marks the end of the Middle Ages and the beginning of a new epoch in Europe. Many Greek scholars moved to Italy, initiating there the development of European Humanism, while the legal succession of Byzantium and leadership of the Orthodox Church transferred to Tsardom and the '3rd Rome' in Moscow. By losing access to the Black Sea Europe was deprived of the land route to India; the search for a new sea route brought about the oversea discoveries of the New World. This Blog was established in 2009 to support our class sharing and communication. It has taken a year to come into regular use- I am hoping it will serve as a welcome space for all class parents.